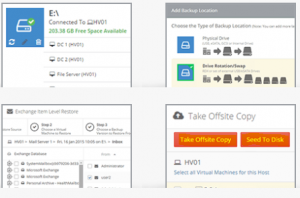 Altaro & HDCE are partners to offer you Cloud Hyper-V backup system. We have a thorough knowledge of Hyper-V and we are aware of your requirements in this regard. Our customers adore us. The quality of our customer support and of our files tells it all. We bet you will also fall under the spell! All other solutions will take hours to prepare. With Hyper-V, you will be ready in only 17 minutes. 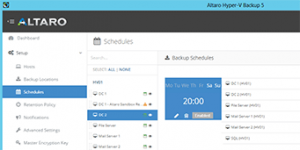 Altaro Hyper-V Backup is built and designed to make Microsoft Hyper-V backup easier than ever. The system includes refined, sophisticated and very affordable features. You will be operational within a few minutes! Your machines will be protected by flexible functions for automated backups. Hyper-V offers a host of granular recovery options to quickly and safely recover your data. Designed to make life easy for you! Altaro Hyper-V Backup allows you to make backups and to recover your Hyper-V virtual computers easily and quickly, with an intuitive user interface designed to be user-friendly. No need to face complex configurations! No frustration when trying to understand how it works! You can start your first VM backup within a few minutes without being a Hyper-V expert, and protect your virtual computers after a major crisis. No complex configuration necessary: you will be operational within a few minutes!